Flávio’s life totally changed at 20 years old. A founding member of the Juventude Esporte Clube, a team of Fortaleza, the fifth largest city in Brazil, the defender midfielder lost sight of his right eye after suffering from severely mistimed tackle in a game in 1989. A year later, blindness affected the other eye. His world fell, but football brought him back to life. A passionate fan, Flávio Aurelio Silva has not resigned from Juventude. He started working at the board, as a kind of handyman. He scheduled matches, prepared the uniforms and motivated players. But, in 2005, the team coach retired. Who would be the right man to take charge? The Blind Boss, called Ceguim (Little blind man). And thus began his curious story, unique in Brazil. Flávio is the only visually impaired coach in Brazilian football. 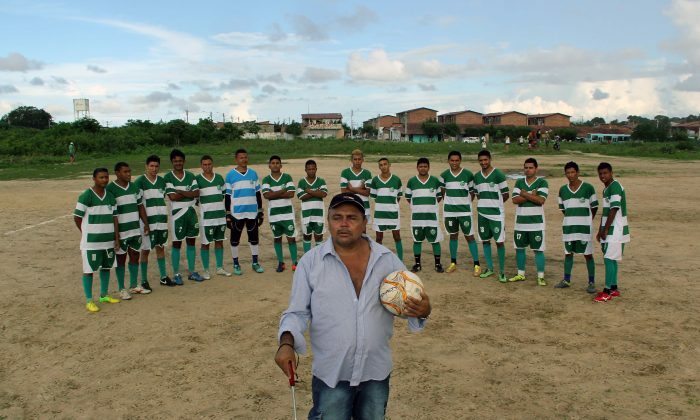 He leads the most traditional amateur team in Bom Jardim, one of the most violent neighborhoods of Fortaleza. The team has five titles in 30 years of participation in the local league (rated at the 9th level in the country), the most of any other club. “I am proud that I was founder, player and, nowadays, even blind, I am the big boss,” says the 48 year old coach. This perseverance pushes the players, who are not paid. More than a coach, Flávio is an inspiration. “Every single player works hard for him. We come to the matches because of him,” says midfielder André Barbosa “Piaba,” a 37 year old. The center forward newcomer even gets emotional when speaking about the boss. “He sees better than any other coach,” praises the electrician Deone Lopes, 35. When some of the players feel too lazy to go to the club, just remember Ceguim’s journey to Bom Jardim. He was born in the neighborhood, but now lives 20 km away. To get to the club, he takes three buses in a 1 hour 30 minute trip. And alone. “I am a Flávio fan”, celebrates Francisco Moreira, 52, a supporter. After two and a half decades of disability, the coach seems to be able to see. The distance between the Juventude’s headquarters and the training field is 30 blocks. The club has no bus and we take Flávio to the training field. Close to reach the destination, Ceguim warned, “In two streets, turn right.” On the corner, here it is. Even being retired and on disability, Flávio works as a dealer of leather belts. Every 15 days, he puts Juventude aside to travel around the country with his products in his backpack. In Belo Horizonte, he met his wife, with whom he has two daughters. “It was a shock sticks. She is also blind,” he said. Flavio is an idol, especially for his wife. He teaches her every day that there is no barrier for life. “For someone disabled, a blind football coach is a lesson,” says Geovania Carreiro, 42. “I do everything for Juventude. From here, I will only leave dead,” says Flávio. The fans, proud of the five trophies, thank him for his devotion. Juventude has a shell inspired of Esporte Clube Juventude, from Caxias do Sul, South of Brazil, that disputes the 3rd division of the Brazilian Championship. Even the foundation year of the “original” (1913) is written in the generic shirt, while the amateur Juventude had been established seven decades later, in 1985.